Ex Astris Scientia - Where are the Jefferies Tubes? 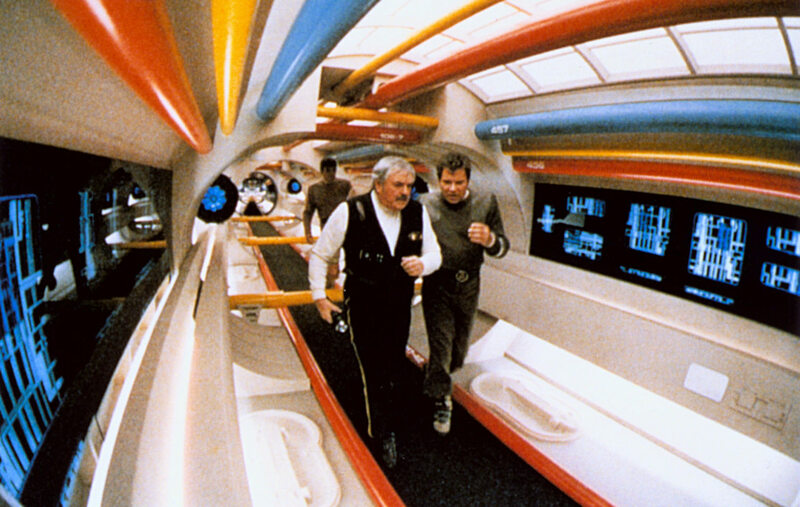 Jefferies tubes are named in honor of the late Matt Jefferies who designed the original Enterprise and conceived an access tunnel in which Scotty had to perform delicate repairs several times. Most Jefferies tubes on various ships seem to have in common that they are less than one meter tall, so that it's necessary to crawl through them. Although this is so mainly for dramaturgic reasons since the time of TOS, we have to find a technical explanation for the size and locations of Jefferies tubes too. 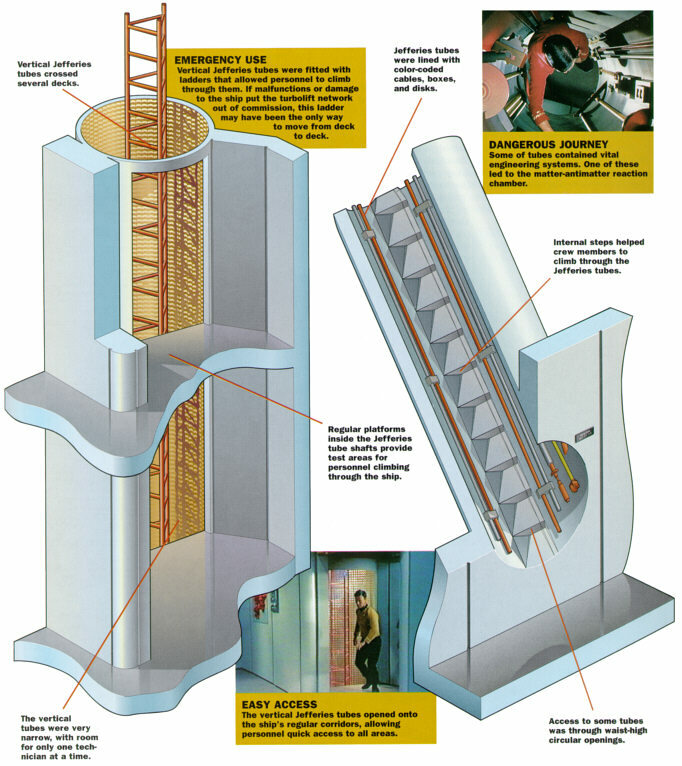 While the normal corridors and the turbolift shafts appear on all main system displays and their structure is quite clear, since they always require a full deck height, it is uncertain if and where there is room left for the Jefferies tubes on different ship classes. 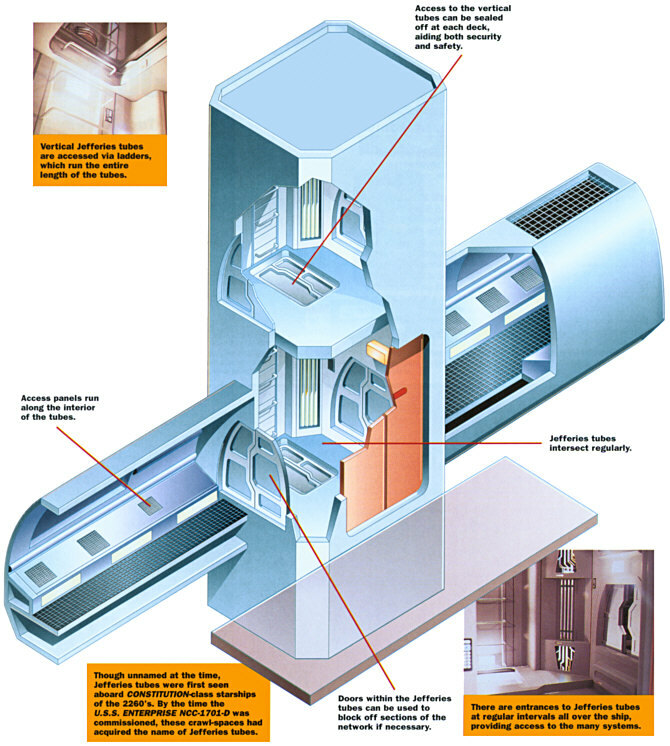 The key question is whether the tubes have the same floor level as the inhabitable part of a deck, or whether they are rather between two decks. 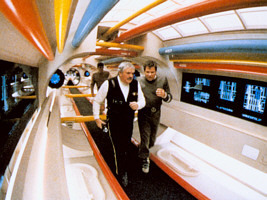 The Jefferies tubes on the original Enterprise had a round cross-section. They were always open to the corridor, and they were sloping up into the wall. It is not certain if the Jefferies tubes were really combined to a continuous network, for only the first two or three meters could be seen in TOS. If, however, they were all connected to one another it seems that they were rather not running at the bottom of each deck. There were also some open vertical shafts with ladders which may have been part of the tubes network, or these were just shortcuts from one deck to another instead of stairways. Non-canon noteShane Johnson's Mr. Scott's Guide to the Enterprise describes that there's only one tube, running inside the back of the interconnecting dorsal. 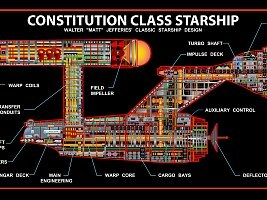 Although this is meant to describe the Constitution refit, it could explain the slant of the tube that Scotty was found in so frequently even rather than anything seen on the refit itself. ENT: "In a Mirror, Darkly" eventually shows what was never seen in TOS: the continuation of the Jefferies tubes stubs. It is evident that the Jefferies tubes form a network like on later ships too. 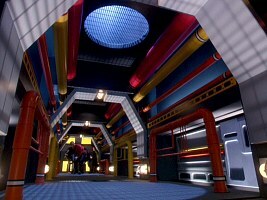 The corridors are quite spacious but otherwise not unlike those on the Enterprise-A (see below). The only time a service tunnel could be seen on the Enterprise (refit) was in Star Trek V. It was a large corridor that allowed to stand upright, but laid out very impractically with pipes running across the floor and regularly spaced low bulkheads on one of which Scotty bumped his head. Since the usual decks on the ship are only a bit more than 3m tall overall, this type of Jefferies tubes must be on the same level as the inhabitable area. 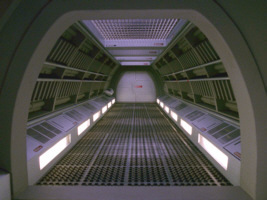 We have seen access hatches to the Jefferies tubes and parts of the tubes themselves on the regular floor level on the Enterprise-D, for example in TNG: "Realm of Fear", "Rascals" and "The Quality of Life". This would support the assumption that the Jefferies tubes are rather within the decks than between them. 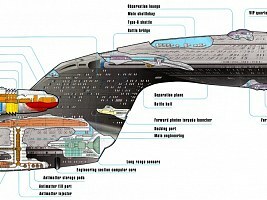 According to the STTNG Blueprints, however, the decks of the Enterprise-D are mostly between 3.2m and 3.6m tall, including the spacing between two decks. There are even a few exceptionally low decks of less than 3m and, on the other hand, only deck 36 (main engineering) is over 4m tall. This leaves absolutely no space for Jefferies tubes between most of the decks, considering that the average clear room height is already at least 2.5m (rather 3m in most cases). 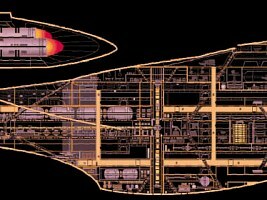 Therefore the Jefferies tubes on the Enterprise-D would have to occupy a certain portion of each deck. Alas, the deck plans don't show anything that could be tubes on the deck level, but only rooms, corridors and turbolift shafts. So if the STTNG Blueprints and the MSD with 42 partially quite low decks were correct, there could be no Jefferies tubes at all on the ship. 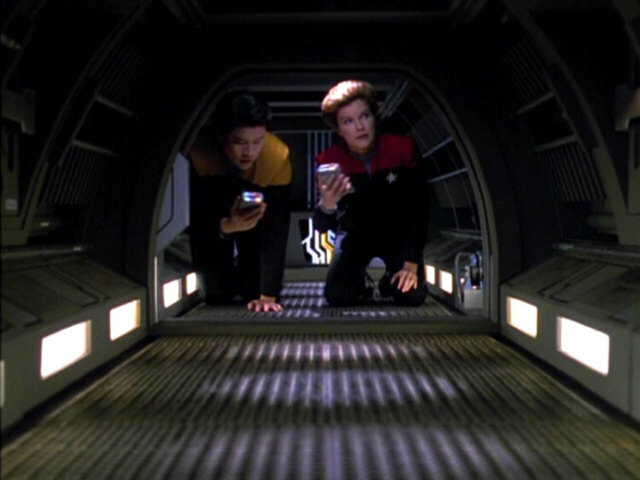 Like on the Enterprise-D, the access hatches on Voyager which could be seen in corridors and in sickbay are always close to the floor, and in some cases one could see that at least part of the horizontal tubes themselves were on the same level too. 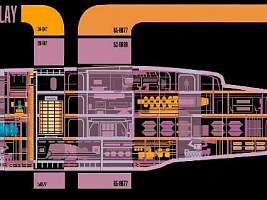 The basic structure of decks and corridors on Voyager is similar to the situation on the Enterprise-D, but most decks are considerably taller (over 4m). Looking at the Voyager MSD we may postulate that the Jefferies tubes on Voyager actually occupy the space between some of the decks whose clear height seems to be reduced. In VOY: "Basics" the EMH asks for Suder's location, and the computer replies "between deck 8 and 9". Briefly after that Suder emerges from a Jefferies tube in sickbay. There is, however, nothing in the MSD that looks as if it is supposed to be actually a Jefferies tube and there are no official deck plans so far, so the ship would allow both Jefferies tubes options. 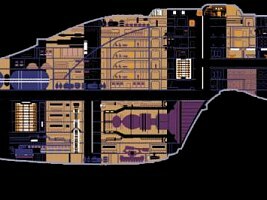 The Defiant has very tall decks of up to 4m at its most likely length of at most 120m if we ignore the "official" figure of 170m (which would be ridiculous if the ship has just four decks like on the MSD). This would allow Jefferies tubes between the decks, especially if we keep in mind that the clear deck height on the Defiant is somewhat lower than on other ships. 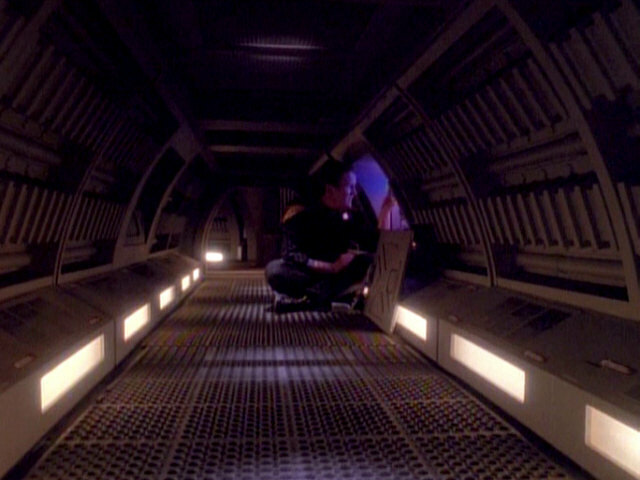 On the other hand, there are apparently access hatches on the normal deck floor level (seen in DS9: "The Adversary"). The MSD shows rather thick separation lines between exceptionally tall decks which, however, wouldn't be sufficient for Jefferies tubes between the decks - unless the MSD is not precise in that it intentionally blows up the inhabitable space at the expense of the Jefferies tubes. This might also explain the discrepancy between the MSD and the actual clear height as seen inside the Defiant. 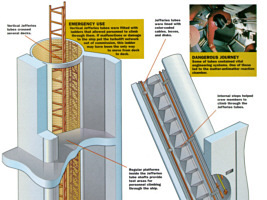 Alternatively the MSD may accidentally show a cross-section that doesn't run through any of the tubes. Maybe the ceiling is even moved up in areas where there are no Jefferies tubes, so the MSD could be correct. The deck plans in the DS9 Technical Manual which, despite all the trouble with the ship's size, are consistent at 120m don't show any Jefferies tubes. Since it wouldn't additionally reduce the scarce inhabitable area of the ship, the Jefferies tubes are most likely between the decks. 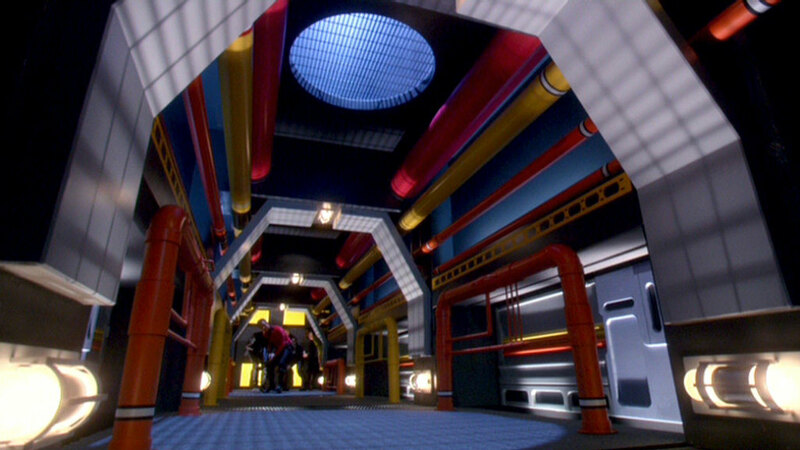 Various access hatches could be seen in the corridors and in sickbay in "First Contact", always close to the floor. The floor-to floor spacings on the Enterprise-E are all around 4m, according to the MSD. As it is the case on Voyager too, this would leave enough space between floor and ceiling for Jefferies tubes between the decks. The MSD supports this idea. Unlike it is the case on all other MSDs, there are many decks whose upper third or quarter is separated from the rest. These upper portions with their characteristic "ribs" are almost definitely supposed to be Jefferies tubes. So most likely all Jefferies tubes on the Sovereign class are mostly located between the decks and only some smaller portions near the access hatches are on the bottom of the decks, although the lack of deck plans would allow a complete system of deck-level Jefferies tubes too. On the Enterprise-D, Voyager and perhaps on the Enterprise-E too, at least a part of the Jefferies tubes seem to run exactly on the same level and in parallel to full height corridors. It would be pointless if this were the case with all Jefferies tubes, since the access to plasma conduits and other systems in the wall would be much easier from the normal corridor. Actually, at least on newer Starfleet ships every corridor wall seems to have removable panels for servicing. It would make sense to have low Jefferies tubes on the deck levels if there were conduits above and below the tubes which would be hard to access from the normal corridors. In every case, however, something is accessed from inside a Jefferies tube in various episodes it seems to be in the side walls. 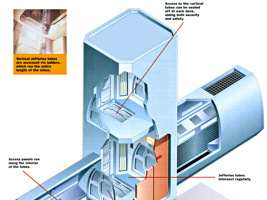 Thus, if Jefferies tubes share a common floor (ceiling) with the inhabitable area, it is unknown what should be above (below) them that cannot be accessed from there or doesn't even need maintenance. If Jefferies tubes are located between the decks on ships whose deck spacing would allow this, it is not evident how much area they would cover. The overall area and volume would be huge if there were a between-deck for each deck. All power, data and other supply lines are supposed to form a grid, rather than occupying large areas or volumes, and the Jefferies tubes can be supposed to follow them. It would be a waste of space if the rest were be empty and wouldn't be even used to extend the Jefferies tubes. It is possible that there are water tanks and other storage spaces though, and at least part of the rooms may have a raised ceiling (or lowered floor). Summarizing, while the Jefferies tubes are a fine idea to provide access to distributed ship systems while not consuming too much volume (not to mention the dramatic impact of crew members crawling through them), it was never made clear where in the ship they are actually located. With the exception of the Sovereign class there are no Jefferies tubes visible in MSDs. On other ships and especially the Galaxy and Defiant it is difficult to explain where the Jefferies tubes are located with neither the MSDs nor the deck plans showing them. Thanks to Florian for a quote from Voyager, to Felix for an observation about the Defiant Jefferies tubes and to Matthew Frizzell for the note about the supposedly one tube on the Connie refit. Some screen caps from TrekCore.